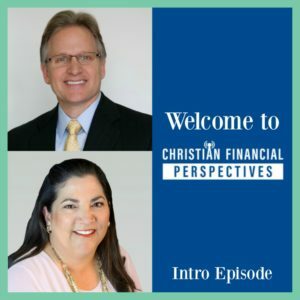 Learn about Christian Financial Perspectives, why we started the podcast, and about our hosts. The Bible can provide a foundation for all of our money management principles and all of the basics for financial planning and how to create a financial wellness plan for you and your family. All we have to do is look for it, and it’s there! Scripture speaks on how to invest, how to handle money on a daily basis, paying taxes, and so much more. There really are very few people talking about this right now, and we are excited to be bringing this information to people all over the world through our Christian financial podcast. Over 20 years ago, Bob Barber was one of the original people involved in the Biblically responsible movement that came out of the socially responsible movement. He has 34 years of professional experience. He began in real estate in May 1984, and he worked his way into the financial advisory business in 1993. During the real estate years, he was involved in over 140 real estate transactions, which was great for experience because the biggest transactions individuals usually make is in real estate! Mary Jo Lyons has over 40 years of professional experience, and 20 years of that has been in the investment arena. She has been a CFP® since 2004. Both Bob and Mary Jo put a lot of themselves and their passions into the podcast. Everyone has a past and a story to tell – especially when it comes to making financial decisions – and Bob and Mary Jo are excited to share these stories when it comes to making financial decisions that are more often than not also emotional decisions.